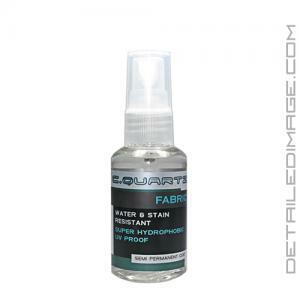 Protects fabric surfaces from dirt, grime, stains, etc. Apply to carpets, mats, upholstery, fabric seats, convertible tops, etc. With a simple mist of the CarPro Cquartz Fabric, you can protect your fabric surfaces from future contamination! Even if you are the most careful car owner, you can accidentally step in dirt, grime, grease, gum, etc. or have careless passengers that stain fabrics by accident. With only a few sprays, the barrier created by CarPro Fabric will help repel stains, soil, harmful UV rays, water, mildew, salt, soda, coffee and anything else your fabrics come in contact with on a day to day basis. Utilizing nanotechnology particles, CarPro Fabric bonds to each individual fiber for an incredibly strong barrier. This allows the product to not only protect your fabric convertible tops, fabric seats, headliners, fabric wheel wells, upholstery, carpets, floor mats, and other fabric surfaces, but it will do so without compromising the look, feel, or comfort of the fabric. What you are left with is a super hydrophobic fabric surface that is durable, flexible, and long lasting. Not only will you be protected against contamination, but future cleanings will be much easier as well. Don't let everyday contamination stain your fabrics, use the CarPro Cquartz Fabric to protect your fabric surfaces today! Clean the fabric free of dirt and oils. Spray evenly across surface. Work into fabric with sponge. Let dry for 24H. without water contact. I'm hoping this protects our new couch! I love all the other CarPro products I've used... so I'm hoping this one performs as well! I tried this out on my mesh fabric running shoes since they used to get wet and get my socks soaked before. After applying liberally to the mesh, I no longer have to worry about rain drops getting my shoes or socks wet. This works really well and will be my go to for protecting cloth interiors. It does get a little sticky if it's applied to non-cloth though, so be careful of that. Also, after washing the lower plastic portion of my shoes with Meguiars APC (1:10) to clean the dirt that stuck to the coating overspray, it appears the fabric is no longer beading or protecting from stains - I ended up getting a slight stain. I'm planning to clean the mesh fabric and re-apply. Maybe Meguiar's APC is too strong since the beading was supposed to return after APC washing based on CarPro's video?